You can reduce your chances of developing high blood pressure by consuming less salt. You also can take several other steps to help keep your blood pressure in the healthy range. In the body, sodium—which you get mainly from salt—plays an essential role in regulating fluids and blood pressure. 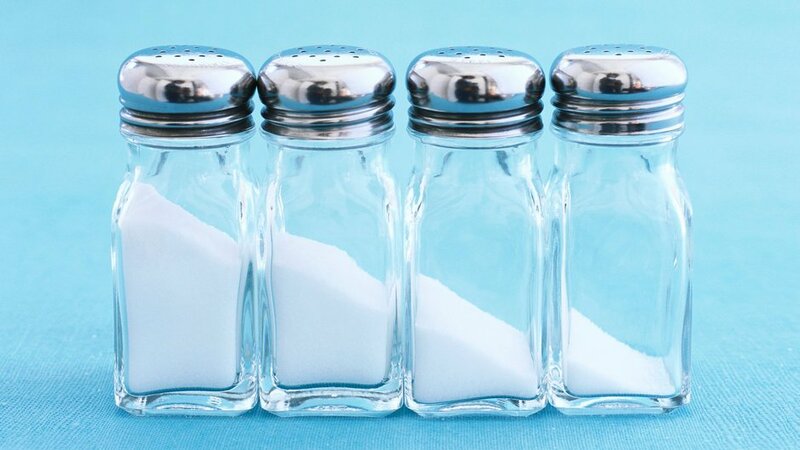 Many studies in diverse populations have shown that a high sodium intake is associated with higher blood pressure. There is no way to tell who might develop high blood pressure from eating too much salt. However, consuming less salt or sodium is not harmful and can be recommended for the healthy, normal person. At present, the firmest link between salt intake and health relates to blood pressure. High salt intake also increases the amount of calcium excreted in the urine. Eating less salt may decrease the loss of calcium from bone. Loss of too much calcium from bone increases the risk of osteoporosis and fractures. Aim for a healthy weight: Blood pressure increases with increases in body weight and decreases when excess weight is reduced. Increase physical activity: it helps lower blood pressure, reduce risk of other chronic diseases, and manage weight. Eat fruits and vegetables. They are naturally low in salt and calories. They are also rich in potassium, which may help decrease blood pressure. If you drink alcoholic beverages, do so in moderation. Excessive alcohol consumption has been associated with high blood pressure. Is Lowering Salt Intake Safe? Eating too little salt is not generally a concern for healthy people. If you are being treated for a chronic health problem, ask your doctor about whether it is safe for you to reduce your salt intake. As a public health measure, some table salt is fortified with iodine. If you use table salt to meet your need for iodine, a small amount—about 1/4 teaspoon of iodized salt—provides more than half the daily iodine requirement. Your body can adjust to prevent too much salt loss when you exercise heavily or when it is very hot. However, if you plan to reduce your salt intake and you exercise vigorously, it is sensible to decrease gradually the amount of salt you consume. Salt (sodium chloride) is the main source of sodium in foods. Only small amounts of salt occur naturally in foods. Most of the salt you eat comes from foods that have salt added during food processing or during preparation in a restaurant or at home. Some recipes include table salt or a salty broth or sauce, and some cooking styles call for adding a very salty seasoning such as soy sauce. Not all foods with added salt taste salty. Some people add salt or a salty seasoning to their food at the table. Your preference for salt may weaken if you gradually add smaller amounts of salt or salty seasonings to your food. Most people consume too much salt, so moderate your salt intake. Healthy children and adults need to consume only small amounts of salt to meet their sodium needs—less than 1/4 teaspoon of salt daily. The Nutrition Facts Label lists a Daily Value of 2,400 mg of sodium per day. This is the amount of sodium in about 1 teaspoon of salt. 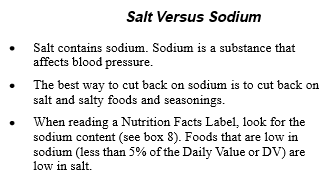 See below for helpful hints on how to keep your sodium intake moderate. Choose fresh, plain frozen, or canned vegetables without added salt most often—they’re low in salt. Choose fresh or frozen fish, shellfish, poultry, and meat most often. They are lower in salt than most canned and processed forms. Read the Nutrition Facts Label to compare the amount of sodium in processed foods—such as frozen dinners, packaged mixes, cereals, cheese, breads, soups, salad dressings, and sauces. The amount in different types and brands often varies widely. Look for labels that say “low-sodium.” They contain 140 mg (about 5% of the Daily Value) or less of sodium per serving. Ask your grocer or supermarket to offer more low-sodium foods. If you salt foods in cooking or at the table, add small amounts. Learn to use spices and herbs, rather than salt, to enhance the flavor of food. Go easy on condiments such as soy sauce, ketchup, mustard, pickles, and olives—they can add a lot of salt to your food. Leave the salt shaker in a cupboard. Choose plain foods like grilled or roasted entrees, baked potatoes, and salad with oil and vinegar. Batter-fried foods tend to be high in salt, as do combination dishes like stews or pasta with sauce. Ask to have no salt added when the food is prepared. Choose fruits and vegetables often. Drink water freely. It is usually very low in sodium. Check the label on bottled water for sodium content. Choose sensibly to moderate your salt intake. Choose fruits and vegetables often. They contain very little salt unless it is added in processing. Read the Nutrition Facts Label to compare and help identify foods lower in sodium— especially prepared foods. Use herbs, spices, and fruits to flavor food, and cut the amount of salty seasonings by half. If you eat restaurant foods or fast foods, choose those that are prepared with only moderate amounts of salt or salty flavorings.